I'm very proud of myself. This recipe came* from the most recent Food Network magazine. This really shouldn't be a cause for celebration, but to me it is. Because it means that I have now cooked two recipes from one month's magazine!! And considering I normally tab about 40 recipes in each of the three magazines I receive each month (Cooking Light, Food Network, and Bon Appetit) but rarely make one, this is quite the achievement. I've been forcing myself to cook and bake from the many magazines I get on a monthly basis and the ridiculous amount of cookbooks I own. I don't know why I tend to cook and bake from food blogs. I think there is something to be said about recipes that come attached with pictures of the finished product. Not many cookbooks or magazines can pull that off without charging a ridiculous amount. So, I gravitate towards the photos that look most appetizing and go from there. But given the money I spend on the cookbooks and magazines, it's time to give them some love too! We absolutely loved this hearty soup. It is an ideal 30-minute meal that can easily be prepped in 10 minutes. Everything practically goes into the pot at once so once it's in and simmering, you're good to go. The soup was very good. I loved the flavors and most especially, the colors. (We recently replaced the lightbulbs in the kitchen. Sadly, this photo was taken prior to the lightbulb change.) The seasoning is mixed in with the ground beef and after that it is super simple. Ron served as my sous chef for this recipe and helped with the canned ingredients. (This recipe can easily be made with fresh products, as opposed to canned, but the cans are the sole reason the recipe is simple so adapt as you wish.) I might hire him from here on out. The recipe makes a ton of soup so you'll have plenty of leftovers. Enjoy! In large bowl, add ground beef, 1 Tbsp italian seasoning, paprika, salt, and pepper; mix to combine. Crumble mixture and add to skillet with diced onions. Brown in skillet over medium heat. In large pot, combine browned ground beef mixture, diced tomatoes, corn, chicken broth, water, 2 Tbsp italian seasoning, garlic, spinach, carrots, salt, and pepper. Over medium-high heat, bring to a boil. Once mixture is boiling, add tortellini to the pot and boil for 3 minutes. Decrease heat to low and simmer for 20 minutes. The Waldorf Salad, which is a blend of apples, celery, and walnuts, is a pretty dated recipe; it was first served in the 1890's at NYC's Waldorf-Astoria Hotel! I've never really made a true Waldorf Salad before. The salad is typically made with a mayonnaise dressing and I've been trying to lighten things up around our house, so I was very excited when I saw this "Waldorf Salad Reinvented" recipe in Mark Bittman's column in Cooking Light. This recipe uses steel-cut oats and adds a very unique texture and flavor to the recipe. It is a healthy accompaniment to a dinner, a hearty salad by itself, and stores wonderfully. If you don't like the oats, you can replace it with any grain to suit your preference. I'll be making this again next time I'm in the mood for something wholesome, flavorful, and crunchy. Combine oats, 1 cup water, and 1/2 tsp kosher salt in a medium saucepan; bring to a boil. Reduce heat, and simmer for 7 minutes (do not stir) or until liquid almost evaporates. Remove from heat; fluff with a fork. Place oats in a medium bowl, and let stand for 10 minutes. Combine walnuts, honey, and red pepper in a small nonstick skillet over medium heat; cook until 4 minutes or until nuts are fragrant and honey is slightly caramelized, stirring occasionally. Combine remaining 1/2 tsp salt, olive oil, vinegar, and black pepper in a small bowl, stirring with a whisk. Add dressing, apple, radicchio, and grapes to oats; toss well. Place 1 1/2 cups oat mixture on each of 4 plates, and top each serving with about 3 Tbsp walnut mixture and 2 Tbsp of crumbled cheese. In the years that I've posted on this food blog, I've learned that all food cannot be aesthetically pleasing. I'm sure this soup could look beautiful in appropriate lighting and with the correct dishes. But the soup looks like baby food, to be kind. However, I refuse to keep this recipe from the blog simply because it does not look as appetizing as other things on this blog! This delicious meal has a backstory! Since moving to Seattle, we've gotten hooked on the corn and green chile bisque from the Metropolitan Market. We tried this soup shortly after we moved and now probably go there at least once a week to grab a bowl to go with a side of Macrina bakery potato roll (or olive roll). It's delicious and my favorite take-out meal of all time. That's saying a lot. But it's also super devastating when we head into the store to find out that they don't have the soup on the daily rotation. This has happened all too often so I decided it was necessary to find the recipe to make in our own kitchen. Nope. The grocer has other ideas. I've searched everywhere online but cannot find this top-secret recipe. So, the last time I was there, Ron grabbed a bowl and I turned over the sign to check out the ingredients and attempt some adapting at home. This recipe isn't the same creamy bisque that is served at the Metropolitan Market (probably because it lacks heavy cream!). But it's quite a delicious substitution to satisfy for the Metropolitan's recipe. The recipe uses a lot of canned ingredients but you can easily use freshly shucked corn, chiles, and tomatoes in lieu of the cans. But the cans save some time to make this a quick meal and absolutely delightful. Enjoy this on your next chilly fall day! And as the potato roll is an absolute necessity to pair with the soup, I decided to try my hand at baking my own potato loaf from the Macrina Bakery cookbook. This cookbook is incredible, Macrina Bakery is a must-visit, and the bread was amazing! Recipe will follow. . .
Heat the olive oil over medium heat. Add the onion, jalapeno, red and green bell peppers, and saute but do not brown. Add 3 Tbsp of flour to the onions and peppers; stir. Add the corn, green chiles, and tomatoes; stir. Add the spices, milk, half and half, and broth; stir. Bring to a boil then reduce to simmer for 20-30 minutes until blended together. Taste then season with salt and pepper. With an immersion blender, pulse the soup but do not puree. Soup should be chunky. (Alternatively, you can transfer soup to a blender or food processor and pulse. I pride myself on the fact that I eat relatively healthy. But I'm far from perfect as evidenced by the multitude of sugar-laden baked goods on this blog and the nearly-empty bag of chocolate chips in the fridge (none were used in any baked product). And I can't resist splurging every now and then. Buffalo Chicken Dip is one of those dips that I simply cannot resist and always save some room to splurge. We often serve it on game-days when watching the Steelers beat the crap out of other teams, like the Seattle Seahawks, who they shut out earlier this morning. . . (No comment about last week's ill-attempt at football from the Steelers.) But anyway, Buffalo Chicken Dip can certainly take its toll on one's waist! The average recipe has a minimum of 16 ounces of cream cheese, 1 cup of Ranch or Blue cheese dressing, and 1 1/2 cups of cheddar cheese. And most people enjoy it with Frito's! So, I normally limit myself to one or two pathetic little chips and sulk in a corner. So, imagine my delight when I opened this month's Food Network magazine and saw this recipe for 'Buffalo Wing' hummus. Um, seriously? I pretty much schmear hummus on everything from vegetables to toast (it's second to my peanut butter addiction) so I was very excited, albeit skeptical, to try it out. But oh.my.goodness! This stuff is amazing! The magazine published two other recipes (from The Desert Cafe) - sour cream and onion hummus and pizza hummus - that I cannot wait to try! The company has over 175 versions, including kinds like pumpkin pie and butterfinger, but I'm not really into buying 6 x 8oz containers for one person. (At least not in daylight hours.) I might need to go to Baltimore... Anyway, this hummus tastes so good and any buffalo craving is absolutely satisfied. One word of caution though: this stuff makes nearly 4 cups of hummus. Looks like it's a hummus-fest for the next week! Put the chickpeas, chickpea liquid, garlic, tahini, lemon juice, paprika, bbq sauce, hot sauce, vinegar and salt in a food processor. Puree until smooth and creamy. Ron and I used to watch a lot of the reality t.v. food shoes. Hell's Kitchen, Kitchen's Nightmares, MasterChef, Kitchen Impossible, Dinner Impossible, Great Food Truck Race, that show where "Soul Daddy" won three restaurants but then they shut them down within weeks of opening, including the Minneapolis location, and ripped that poor guy's dreams right out from under him and never spoke about it again, NBC Fail. But then we realized that the majority of them annoyed us. We'd actually allow them to back up on the DVR and consume nearly all of our space. Then we'd get stressed out when we realized we had an entire season of the show to watch. It was a nightmare. We hated watching them: the drama, the smoking, the not-so-subliminal advertising plugs... so finally, we pulled the plug. But we did stick with one show: the Next Food Network Star. But we have been watching the most recent winner, Jeff, on a consistent basis. He's theme was "the Sandwich King" and we love sandwiches in this house. His show is new, so it's rocky, but Ron and I actually enjoy watching it. Ron says that it is actually stuff he can do in the kitchen. But Jeff takes us on journeys to restaurants around his Chicago home, so, well... we know I'm a fan. Jeff's show is on Sundays at 11:30am/10:30c. For years, sandwiches were all that I ate for lunch and most dinners. So, it's exciting to watch someone who is passionate about making sandwiches into something special. Sure, his sandwich recipes often take longer than an actual non-sandwich meal to make. But who cares! His concept takes your general ideas about sandwiches: lunch meat, slices of tomato/lettuce, and bread and takes any meal and turns it into a sandwich. We recently tried out these Greek Tacos and thoroughly enjoyed them. My mom loves gyros so I know she'll love these. The home-made tzatziki sauce was amazing and so easy to make! I'm excited to try more of Jeff's sandwiches. Yield: the recipe said 4, but I think this serves like 8! For the Lamb: In a large skillet, heat the oil over medium-high heat. Add the lamb, sprinkle with salt and pepper, and cook until the meat gets nice and golden brown, 10-12 minutes. With a slotted spoon, remove the lamb and reserve. Lower the heat to medium and saute the onions in the lamb juice until soft, about 5 minutes. Add the oregano and garlic and cook until fragrant. Season. Add the tomato paste and cook until it caramelizes. Deglaze with the red wine and scrape any bits up that have adhered to the pan. Add the lamb back in, stir and set aside. For the Tzatziki: Grate the cucumber on the large holes of a box grater and place in a fine-meshed strainer or cheesecloth fitted over a bowl. Salt the cucumber and let sit for 10 minutes. Then squeeze out any excess moisture. Add the strained cucumber into a bowl with the yogurt, feta, garlic and mint. Adjust seasoning as necessary. For the Cucumber Tomato Relish: Toss the olive oil, vinegar, tomatoes, cucumbers and onions in a bowl, adjusting the seasoning as necessary. Cover and let sit for at least 1 hour. To Build: Schmear the tzatziki on the pitas, then place on the lamb and top with cucumber tomato relish. Enjoy! It was a Tuesday. And I was supposed to be in class. But, I'd been having trouble sleeping since I started my freshman year at the University of Pittsburgh. The 8:00 a.m. algebra class on the third floor in the Cathedral of Learning did not help my insomnia. So, when the phone rang at 8:49 a.m., I chose not to answer it because I was afraid it was my mom on the other line, somehow knowing that I was skipping class during the second week of class. Already skipping class. And sure enough, the voice on the other line was that of my mom. She left a message on the machine in my single-person dorm room on the 10th floor of Holland Hall. "Ashley, if you are there, pick up the phone or turn on your t.v. One of the World Trade Center buildings in lower Manhattan is on fire." I picked up the phone to talk with her and turned on the t.v. Images were showing people above the point of impact. They were waving shirts out the window to try and get someone's attention. They were alive. They were desperate to be saved. I opened the door to my dorm room - it was right by the elevator - and people were coming in to my room as they were on their way to class to see what was going on. News reports were saying it was an explosion. Others were saying it was a plane. And then there was an official confirmation that there was a plane that crashed into the first tower. A number of people were in my dorm room at 9:03 a.m. We were all discussing what a terrible accident it was. And then we screamed as we watched a live shot of the second plane hit the south tower. And many of the same people were in my dorm room as we heard that another plane had flown into the Pentagon at 9:37 a.m. And we sat there and we watched, in horror, the news unfolding, history in the making, and a country changing before our eyes. And at 9:59 a.m., we sat there and watched the south tower collapse in a ball of smoke. And at 10:03, we heard that Flight 93 had crashed in Shanksville, PA. And at 10:28 a.m., we watched the north tower collapse. And we watched the live shots of people running for their lives. And we cried. And my mom called back. "We're getting off of campus. Walk up to Chevron." I remember how terrifying it was to get off of campus in Oakland - people thought that the terrorists were going to try and hit the Cathedral of Learning or the U.S. Steel building in downtown Pittsburgh - and the city was an absolute disaster. After Flight 93 crashed in Shanksville, rumors started to spread that the terrorists had over a dozen planes and planned to hit major targets in several different cities. People started saying Pittsburgh, about 65 miles from the crash site, had been one of the target cities. It wasn't. The plane was said to be going to Washington, D.C. But we didn't know that and anything is believable during times of panic. It was almost like the entire city got in to their cars to get as far away from the city as possible. People were yelling at one another, and swearing, and flicking one another off, like no one trusted one another. There was fear and anger in the air. It seemed like the world was coming to an end. I had a number of high school friends in lower Manhattan and in D.C. that morning. And I am a fortunate soul to say that I don't personally know anyone who perished in the horror that was 9/11. In the ten years that have passed since that morning, I've met many people who weren't that fortunate. A good friend of mine from law school worked in lower Manhattan on the morning of 9/11. One day, while discussing the heartbreaks of the world, I asked if she was there that morning. Her tone changed. Her expression softened. "Yes," she replied quietly. "I have many friends that lost their lives in the towers and at the Pentagon that morning." In my junior year of college, I interned for the local coroner's office. One of the case files I had access to was the first responder's Flight 93 case. Pittsburgh was the largest city closest to Shanksville and Pittsburgh responder's were called on-site immediately. I had studied the forensics aspects of the crash site in another class taught by one of the responders, so he asked if I wanted to view the file. I was staring at photographs of a large man-made grave created by some of the greatest heroes in this country on a day where our country experienced the deadliest attack on U.S. soil. I was staring at photographs of inexplainable things. I couldn't look for long. I heard the voices of those heroes' "Let's Roll" in my head. I heard the 911 calls. I heard the panic. A few years ago, Ron spent a summer working in Reading, PA and I would pass by the "Flight 93 Memorial" sign near exit 110 on the PA Turnpike on every trip. I relived the moments of that morning every single time I passed, but now they were moments complete with pictures. Growing up, my parents would talk about historical events that happened during their lifetime. I'd read about something in school and I'd ask them, "Do you remember when you heard that JFK was killed?" And they'd respond that yes, they remember when they heard that JFK was killed, with the exact location, time and feelings they felt at that very moment. I secretly hoped that I'd never have a "memory" like that to share with my children. But, I do. And unfortunately, there have been a lot of those "memories" that have been embedded in my brain since I matured and realized how hard this world can be some times. Every year, I pay a tribute to the victims of 9/11 and those who have since suffered from the aftermath of the tragedy. This morning, I awoke at 5:46 a.m. PST and I've been watching the memorials on CSPAN. Tonight, Ron and I will walk to the Statue of Liberty at Alki Beach for the candlelight vigil. Right now, I'm listening to the victims' families read the names of those lost in the towers that morning. Since the first "anniversary" I've watched the videos, the documentaries, the films, the specials. I reread the transcripts and the 9/11 Commission Report, I look at the pictures, I remember the pictures I saw, I listen to the audio. I find myself going back to these things periodically throughout the year. It is important for me to keep 9/11 in my heart always. I owe it to the people who suffered. And ten years later, it still feels like it was yesterday. Today, ten years after the worst attack on U.S. soil, we remember the fallen. We will never forget the victims and their families. We remember the volunteers and their efforts. We respect the courage of the men and women who fight in honor of this beautiful country. We Remember. September 11, 2001. God Bless America. Make the rice: Place rice in a sieve and rinse under cold water until the water runs clear. Set aside. Melt the butter in a medium saucepan with a tight-fitting lid, over medium-high heat. Add the raisins, almonds, turmeric, cumin seeds, coriander seeds, cardamom pods, and cinnamon sticks and cook, stirring, until toasted and lightly fragrant, about 2 minutes. Add the rice and cook, stirring, until toasted, about 1 minute more. Add the water and salt; bring to a boil. Lower the heat and simmer, wrap the lid tightly with a kitchen towel and cover, and steam until the rice is tender, about 20 minutes. Remove from the heat and let rest, covered, for 10 minutes. Fluff with a fork and set aside. Meanwhile, make the vegetables. Melt the butter in a medium straight-sided skillet with a tight-fitting lid, over medium-high heat. Add the onion and cook, stirring, until lightly browned, about 1 minute. Add the garlic and ginger and cook, stirring, until fragrant, about 1 minute. Add the golden raisins, almonds, coriander seed, cumin seed, and cardamom, and cook, stirring, until toasted and fragrant, about 2 minutes. Raise the heat to high, pour in the water, and cook, covered, for about 4 minutes. Uncover and cook, stirring, until the vegetables are tender and most of the water has evaporated, about 1 1/2 minutes more. Add the rice to the vegetable mixture and stir to combine. Season with salt and pepper to taste. Divide among plates and top with some of the toasted coconut and almonds; serve. I GOT AN ICE CREAM MAKER!! Well, actually. I got the ice cream maker attachment to my KitchenAid mixer. But it works just as well and it is the most amazing thing in the world! 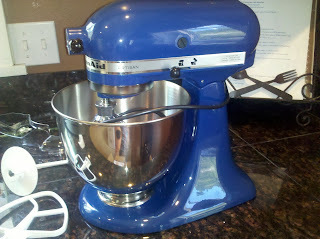 Speaking of KitchenAid mixers, I finally got one and I've used it almost every single day! My mother has been spoiling the heck out of me lately (perhaps its because she's sick of hearing me complain on the phone). She had received some gift cards and gave them to me and I ordered the most beautiful machine ever. It's been put to great use! 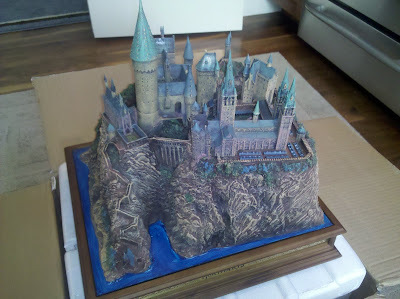 And on the same day my mixer arrived, Hogwarts arrived! This beautiful decoration is sitting on top of the mantle as we speak, front and center. It was like Christmas in July! So, yes. I had to get the ice cream maker attachment. I'm don't normally eat real ice cream. I always opt for that sugar-free, low-fat, or total watery crap for whatever reason. (Note: frozen pureed bananas are not watery-crap and if you haven't tried them, you must!) Well, watery crap no more! I was celebrating my unbirthday (a justified one; my half birthday) the other day and desperately needed good ice cream. So I got all the ingredients ready for this batter and began the process, super excited to eat the most delicious ice cream ever. Fail. Apparently, I turned my custard into scrambled eggs. Scrambled eggs do not make good ice cream. But I didn't give up and tried again. And I will never go eat watery ice cream crap again. In a medium saucepan, combine 1 cup of the heavy cream with the yellow cake mix, sugar, and salt. Heat over medium heat until warmed through. Meanwhile, place the egg yolks in a medium bowl and whisk until smooth. Combine the remaining cream, vanilla, and whole milk in a large mixing bowl with a fine mesh sieve over the top. When the mixture in the saucepan is warm, slowly pour a small amount into the bowl with the egg yolks to temper them, whisking constantly. Continue pouring the cream mixture in a steady stream, whisking continuously until completely combined. Return the mixture to the saucepan over medium heat. Continue heating, stirring and scraping the bottom of the pan, until the mixture thickens slightly and reads 170-175 degrees F on an instant-read thermometer. Immediately pour the custard mixture through the mesh sieve into the bowl with the remaining cream and milk and mix to blend. Cover and chill the mixture thoroughly in the refrigerator. Once chilled, freeze in an ice cream maker according to the manufacturer's instructions. Store in an airtight container in the freezer.